Streptococcus mutans is the primary causative agent involved in dental caries in humans. Among important virulence factors of this pathogen, its ability to form and sustain a polysaccharide-encased biofilm (commonly called dental plaque) is vital not only to its survival and persistence in the oral cavity, but also for its pathogenicity as well. 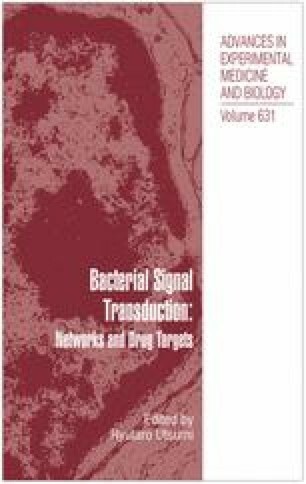 This chapter focuses on the S. mutans’ biofilm phenotype and how this mode of growth is regulated by its density-dependent quorum sensing (QS) system primarily comprised of the Competence Stimulating Peptide (CSP) and the ComD/ComE two-component signal transduction system. In addition to biofilm formation, the CSP-mediated QS system in S. mutans also affects its acidogenicity, aciduricity, genetic transformation and bacteriocin production. Interestingly, it has also been discovered that these properties are optimally expressed in cells derived from a biofilm as opposed to a free-floating planktonic mode of growth. Hence, strategies targeting S. mutans’ QS system to attenuate biofilm formation and/or virulence are currently being used to develop therapeutic or preventative measures against dental caries. Recently, it was discovered that the addition of CSP in large concentrations (relative to amounts used for normal competence development) resulted in growth arrest and eventual cell death, thus paving way for CSP-mediated targeted killing of S. mutants. In addition to the QS system, effects of other two-component signal transduction systems on the biofilm phenotype of S. mutans are also discussed.